Welcome to another round of Throwback Thursdays, folks! I hope you are having as much fun as I am throwing it back. I have been reading old journals and looking at tons of old pictures... so fun to walk down memory lane. For those of you who are joining us for the first time, here's the rundown. My freshman roommates. We took "family pictures." We were so weird. I moved away from home in August of 2004. I had graduated in May, turned 18 in June, and was now ready to be out totally on my own. Looking back, it's weird to me that I was only 18 and living on my own, but at the time I thought I was so old. I didn't love high school and I thought the town I grew up in, Price, was super ghetto. I couldn't wait to get out of that place. (Which is weird- now I look back on my Price memories with great affection." My goal growing up had always been to go to BYU. I dreamed about it, saved up money for it, counted down the days until I would go. I had never wanted something so much in my whole life. Interestingly enough, when the move actually happened I was terrified. I moved to Provo, an hour and a half away from Price. My mom drove me up with all my boxes and I remember when it was time for her to go I was pleading in my head for her to say. I don't know why, but those first days I was so homesick. So so homesick. I was convinced my roommates were boring prudes that I would never get along with (I ended up loving them, of course) and that I was dumb to ever want to leave Price. I guess that's the way it is in life. You want something so bad and then as soon as you get it, you want what you used to have. I always imagined moving into my dorn room, unpacking with my roommate, getting to know each other, laughing, music playing, etc. This was nothing like it. I was all by myself, my stereo didn't work, and I was completely miserable. I had no idea where any of my roommates had vanished to. I attempted to hang pictures on my wall, but they kept falling down and crashing. I couldn't find one of my bozes or my cell phone and I was tripping over all sorts of crap. I took one box of stuff to unload in the bathroom and there found a note that Mary (my little sister) had left for me. On it she had made a list of "50 reasons I will miss you." This was the breaking point for me. I sat there on the bathroom floor with makeup and hair stuff all around and just bawled and bawled. Mary's letter was so sweet and it made me miss her and home so much. I was absolutely miserable and didn't want to be at college anymore. It is so frustrating when everything you have worked for and looked forward to your whole life all of a sudden isn't what you thought it would be. Given, that was the first day. Within a week I was fine. The roommate I still keep in touch with the most- Holly. - I could eat cereal three meals a day. - I could stay out as late as I wanted. - No one made me clean my room. - I felt like I was hanging out with friends all day every day. - Sunday dinners with my family. - Our big yard to go outside and enjoy. The dorm room left me feeling very confined. - The house always being clean. Interesting that the things I loved about being away from home (not having to clean my room) were also the things that I missed about home (having the house clean.) Ain't that weird the way it works? 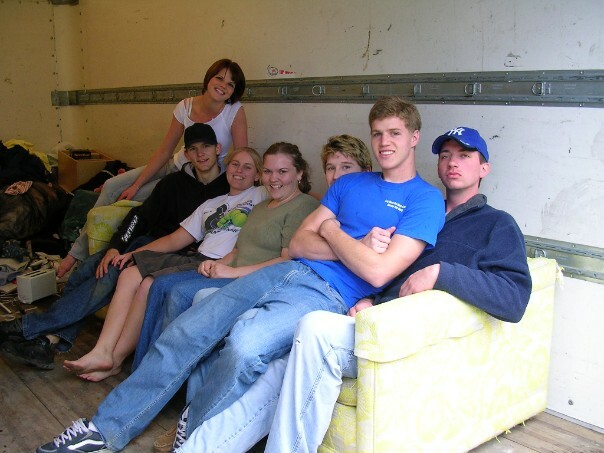 End of freshman year, taking our 7 foot couch back to the thrift store from whence it came. We had some good memories on that bad boy. Oh- one last thing. I remember the first month or so in my dorm room my two roommates, Holly and Jess, talking about this thing called facebook. They kept getting on there and looking at people they knew and I thought, "Why would you look at them on the computer when you could just go hang out with them?" My, how far we have come! Alright, now it's time for you to tell me your first move out stories. Where did you move to? Were you scared? Excited? How old were you? Link up, darlings! ooh I'm soo joining in this week! I love how your stereo not working was such a tragedy. I would totally have said the same thing at that age! It's hard to move out and when we feel sad we have to blame it on something. I was very homesick for like a week or two. I think my mom told me to stop calling her. Ha! Oh Facebook haha! It's so crazy to look back on these things! I remember when you needed a college email just to create an account! Perhaps they should have kept it that way. 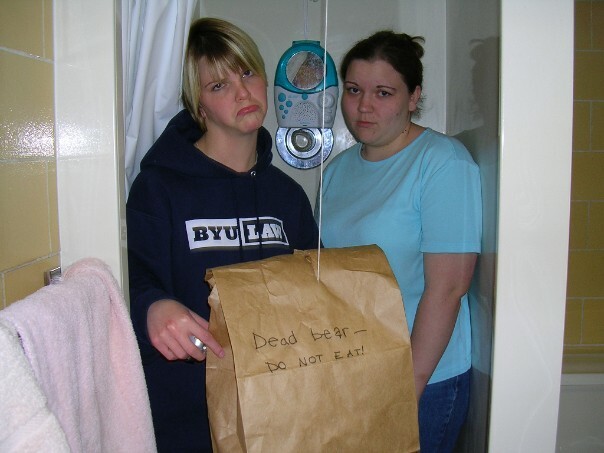 I've always been kind of envious of the BYU students who moved out their freshman year. I'm from Provo so at the time I didn't want to give up the luxuries of living at home when I didn't necessarily have to, but now looking back I wish I would have. haha so funny about the Facebook thing though. I remember when I first found out about it thinking how it didn't seem half as cool as MySpace. ha! Just watch, in ten years we'll be saying that again when a different social media website comes around. I'm loving all of the college stories this week. It makes me miss my college friends! This has to be my favorite so far. I love hearing people's college stories.